Francis Joseph Budd was born July 20, 1939 in Long Branch. He grew up in Asbury Park and suffered from a childhood illness—possibly undiagnosed polio—that left one calf noticeably larger than the other. In overcoming this disadvantage, Frank simply learned to work harder than all the other kids. Frank attended Asbury Park High School. He played football and basketball for the Blue Bishops, but it was as a sprinter that he filled the stands with college recruiters. After graduating in 1958, he joined coach Jim Elliott’s track team at Villanova University, where he developed into one of the fastest runners in the world, earning All-America honors with ’Nova’s dominant track team of that era. Frank’s first taste of top-level international competition came as a member of the American Olympic team in 1960. He was one of three US sprinters favored to take medals in the 100 meters, along with Ray Norton and fellow New Jerseyan Dave Sime. In the final, German sprinter Armin Hary was a surprise winner of the gold. Sime finished second while Frank was a disappointing fifth, with Norton less than a stride behind him. All six runners finished within .18 of one another. Frank recovered from his Olympic disappointment and came into his own in 1961. He won his first 21 races after Rome and at various times that year he established new world records for the 100 yards and 220 yards. He set the 100 yard record (9.2 seconds) at a meet on Randall’s Island, under New York’s Triborough Bridge. The record he broke was first set by Mel Patton and had stood for more than a dozen years. 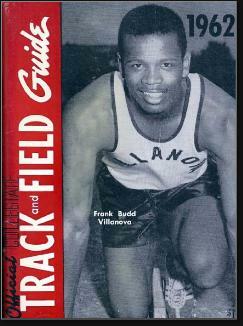 As runners were basically amateurs in those days, Frank began looking for a payday in another sport; under today’s more liberal rules he might have stayed with track until the 1964 Olympics. The Philadelphia Eagles drafted him in 1962 and he made the team as a wide receiver that fall. Frank saw action in four games, catching a total of five passes. He averaged a whopping 26 yards per catch, and scored his only touchdown in a win over the Redskins. In 1963, Frank played for those same Redskins. In 8 games he caught 5 passes, including a 50-yard bomb against the Cardinals. From 1964 to 1966, he played with the Calgary Stampeders of the Canadian Football League. After his sports career, Frank returned to New Jersey, where he worked in the Department of Corrections and for an Atlantic City casino. He retired to Mt. Laurel and attended many reunion events at his old high school. He passed away at age 74 in Marlton.